Well everybody, as you may or may not know I haven’t always been the biggest fan of Mageia. My last review was called “Mageia 3 – Gone In 60 Seconds“. It was given this title for two reasons. The first is that I likened Mageia to Eleanor, the one car that Nicholas Cage couldn’t tame and for various reasons I have always come unstuck whilst using Mageia. The second reason was that 60 seconds was about as long as I was prepared to have Mageia installed on my computer because it just didn’t work when compared to other distributions offering the same benefits such as openSUSE, Ubuntu and Fedora. Two years have past and I skipped Mageia 4 entirely. The thing is though that Mageia does appear to be very popular and it has ridden high in the Distrowatch rankings for a number of years. Whilst the rankings aren’t to be taken too seriously they do give at least an indication of popularity. Mageia is aimed largely at similar user bases to Fedora, openSUSE and Ubuntu but over the years it hasn’t half done some strange things. I mean the sort of things that make you shout “why have you done it like that?”, “why does the GNOME network applet not let you choose the wireless network?”, “why can’t I create a bootable USB?”. I don’t like to be over critical of other people’s work and if I get the chance I like to set the record straight and I welcome the option to have my opinions changed. That is where Mageia 5 comes in. How did it fare this time around? If you go for the classic installation you will end up with big Bertha in terms of file size. If you go for the network installation then the initial download is small but as you choose your installation options the download will increase. The live media gives a sample of Mageia without going full monty and I generally recommend downloading the live media for a distribution. Any other packages can usually be installed from the package manager at a later date. If you have a poor internet connection or you want a USB that boots instantly without having to create it first then you can buy a Mageia USB or DVD from osdisc.com. This time around Mageia proved to be a delight to install. The Mageia website has a good installation guide and lists different ways to create a USB drive whether you are starting from Windows or another Linux distribution. I created my own guide for creating a Mageia USB drive for those of you using Windows and thinking of installing Linux for the first time. I found that the Win32 Disk Imaging tool worked better for Mageia than the other suggested option which is Rufus. After creating a Mageia USB drive you might want to consider reading the Mageia and Windows 8.1 dual boot guide. 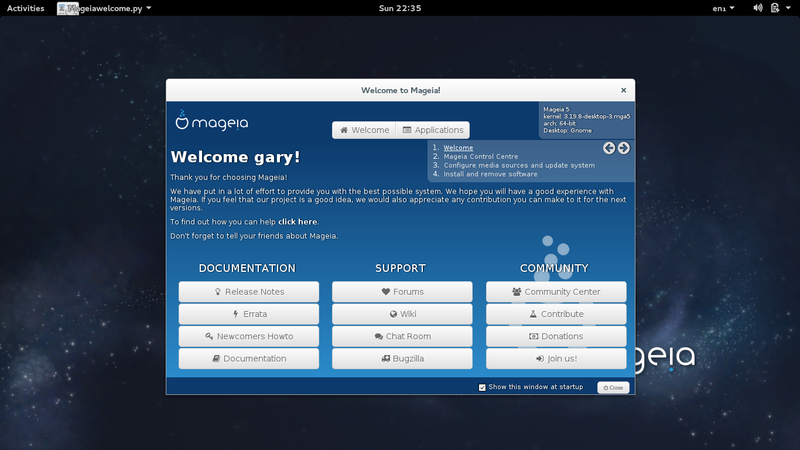 How does Mageia’s installer compare to Fedora, Ubuntu, Mint, openSUSE and Debian? The Ubuntu and Mint installers are obviously very easy to follow and Fedora’s isn’t too bad now either. The openSUSE partitioning piece is just too convoluted. Mageia’s on the other hand is really easy, even if you want to dual boot with Windows 8. Mageia starts with a welcome screen with links to documentation, support and community options including release notes, the forum, a wiki and a rather good newcomers howto section. The desktop environment that I chose was GNOME and so there isn’t much to report on the way it is laid out as by and large it is a standard GNOME installation. Incidentally it is worth pointing out that from the user login menu you can choose whether to use GNOME, GNOME classic or GNOME with Wayland. In my previous review of Mageia I made the mention of the black dash screen. Whatever caused this issue (I know it was two years ago, so shouldn’t be too surprised) has now been fixed. The performance of Mageia is good and there were no crashes during the time I used it. That doesn’t mean there aren’t any problems at all though. In my previous review of Mageia I commented on the fact that the GNOME network manager applet didn’t work. Mageia 5 has resolved this issue, but not in the way you might think. The network manager applet just isn’t there at all. During the installation of Mageia you get the opportunity to create a connection to a wireless network and part of the setup lets you choose to have that connection start at boot time. For people who only use one wireless network this would generally suffice. If you use your laptop to travel and connect to multiple networks then this isn’t particularly ideal. 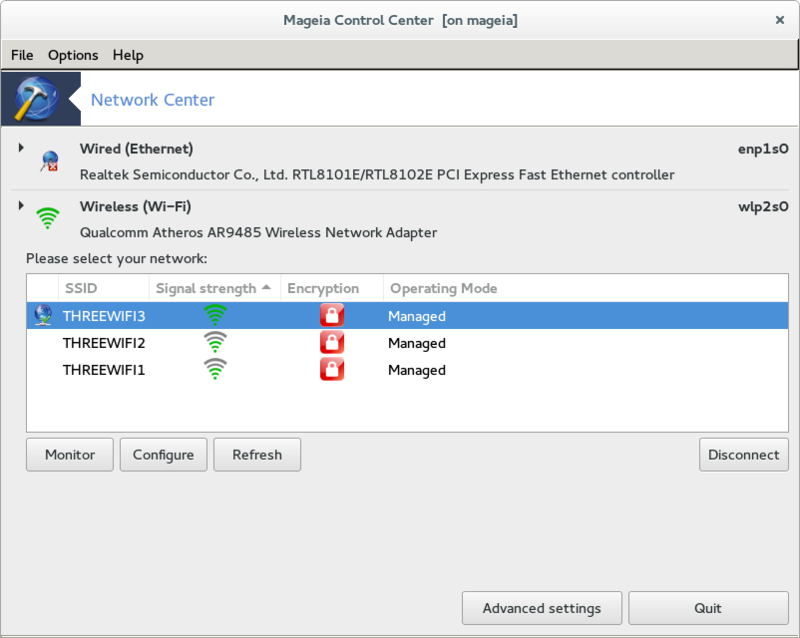 To connect to a different wireless network you have to use the Mageia Control Centre which is in itself a really good tool to help you manage your system. The network management tool that the control centre links to is adequate enough at letting you change your wireless network but it isn’t as simple as selecting from a list in the top right corner of the screen which the standard GNOME applet provides. I have copied this text from the comments section as it maybe helpful to those of you who decide to install Mageia. (Thanks to ReinoutS). If you want to switch to NM, just enable NM (service network stop;systemctl enable NetworkManager; systemctl start NetworkManager) and youcan then abandon draknetcenter and all your interfaces flip over to bemanaged by NM. You don’t even have to touch draknetcenter to do this,nor edit any connection file. 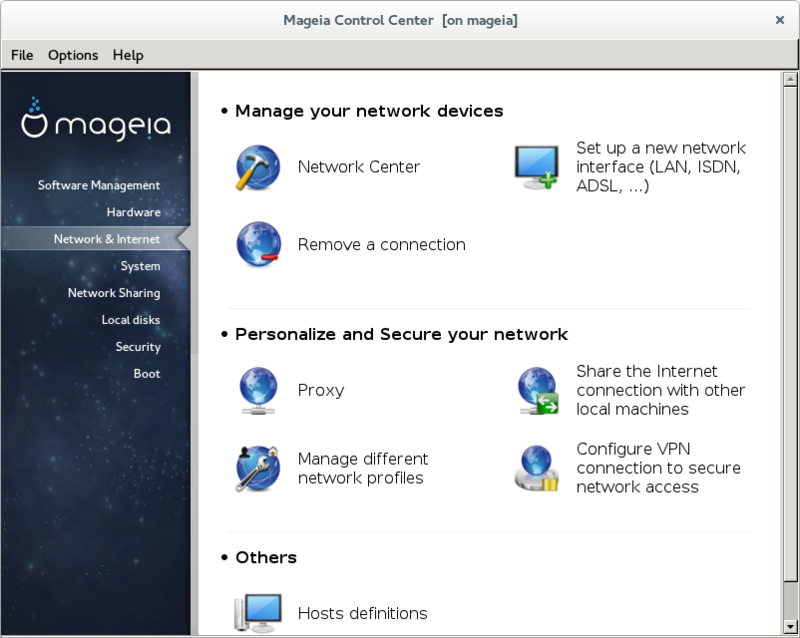 The Mageia control centre lets you manage your entire system from installing software to setting up network connections, from installing hardware to setting up NAS drives. I, like many of you, am now in the situation where most of my hardware is external and wireless. I have an Epson workforce printer which can be accessed not just from any device in my house but by any device on the internet. I can send an email to my printer and it will print it. How easy was it to set up this printer within Mageia? Well it wasn’t as instant as installing it within Ubuntu but on the other hand it wasn’t as hard as installing it via Windows 8. In reality within Mageia all I had to do was go to the Epson website and download the appropriate drivers. Incidentally, Android provided the simplest solution for setting up the printer. I find that everything seems to be easier to do on my phone now than on a computer. The other main network device I have is a Western Digital MyCloud drive. My setup is a little complicated however. Due to my location (very remote) getting a landline broadband connection is hopeless and so I use mobile broadband. These devices don’t provide an ethernet port and the MyCloud device is reliant on an ethernet port. I therefore have a TPLink wireless bridge which uses a wireless connection and provides an ethernet out to the WDMyCloud device. How easy was it to connect to this drive within Mageia? Actually it was very easy. Mageia has Samba installed and all I had to do was select the drive and mount it. All I had to do was open Nautilus and I could read perfectly well from the drive and play audio and video as well. 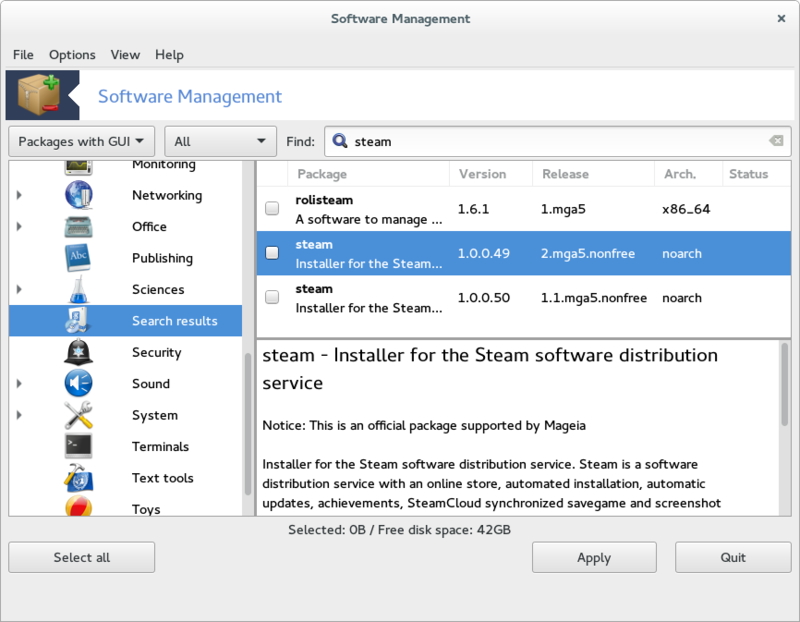 Audio is provided within Mageia by the default GNOME music player. This tool is easy enough to use and you can choose to view by song, artist or album as well as create your own playlists. There weren’t any issues playing MP3 audio. Playing videos caused a few issues. Most of my videos are stored in MP4 format and as soon as I started trying to playback the videos a message came up stating that I would need to install a driver. At first the system couldn’t find a driver and then when it did the videos would play but there wasn’t any sound. Rather frustratingly for other people who might suffer from similar symptoms I was able to fix the issue but I am unsure as to what actually fixed the issue. I started off by turning on the tainted libraries and installing the GStreamer bad and ugly packages although these were already installed from the normal repositories. I also decided to install VLC to see if that would fix the problem and I soon realised I didn’t have audio in that either. After a frustrating hour or so I packed the laptop back in its case, went shopping with my wife and kids and when I came back set in for another go but bizarrely it just started working. I guess the old “turn it off and on again” was all that was required? I am not sure if Flash is supposed to be working or not. I tried Youtube and at first it said I was missing the Flash plugin and then it started playing the video anyway but again I was stuck without sound. I have a simple was of dealing with the Flash thing nowadays. Install Google Chrome and have done with it. 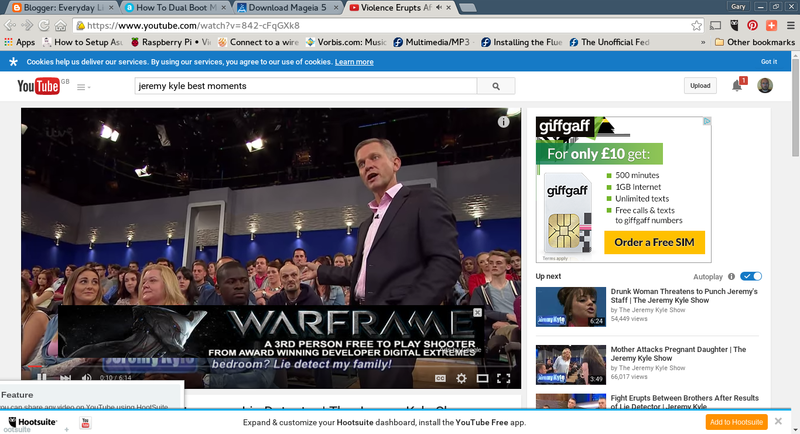 After I installed Chrome the video played perfectly well, I was able to play games and the sound worked. I don’t think any Linux distribution (or indeed any operating system) should be judged on its ability to play Flash video. It is more a symptom of the failures of Flash than Linux in my opinion). I used the live version of Mageia and this may differ from the full installation. 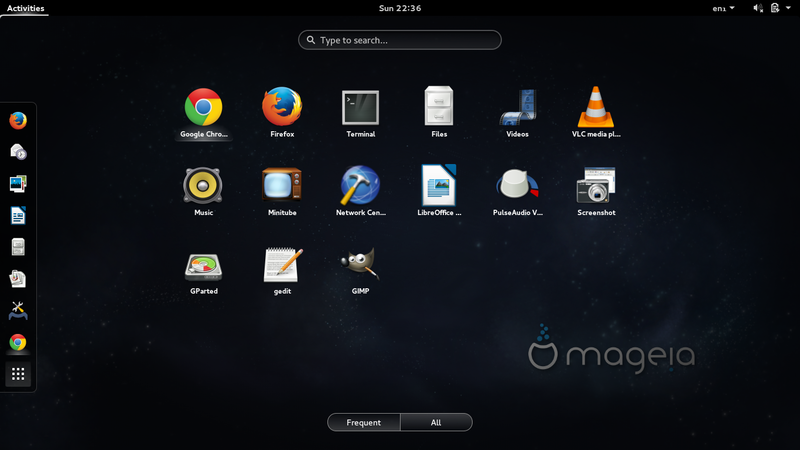 The GNOME version of Mageia has everything the average person needs to get started. As mentioned previously most administration tasks can be done by using the Mageia Control Centre. Installing applications is no different in this respect. There are two tools which can be selected. The first tool lets you configure the repositories where the software can be installed from and the second physically lets you choose the software you want to install. The list of repositories is actually quite long with links to local repositories (i.e the installation DVD/USB), core repositories, updates, backports, non-free, tainted and 32-bit. The graphical installer is fairly straight forward to use and at least it isn’t the Ubuntu Software Centre. The left pane has a list of categories and when one is selected the right pane shows the applications within that category. Selecting an application shows a description within the bottom right pane. The search bar at the top can be used to search by title or by a general description of the application you wish to find. Mageia 5 works and it is so much better than any previous release that I have ever used. I think it would be good if the wireless connection could be chosen from the panel at the top of the screen rather than using the Control Centre but it isn’t a huge issue and certainly should not detract from the positive aspects. The installer is very good and the average person should easily be able to follow the on-screen instructions. Failing that there is a comprehensive installation guide and wiki page on the Mageia website. GNOME is a great choice for the casual user as a desktop environment. It is easy to navigate and keeps out of the way. The Mageia Control Centre is a good tool for managing your software installations, your hardware and internet connections. There haven’t been any crashes since I started using Mageia. The only real issue I had was the lack of sound whilst watching MP4 videos which I can’t give an answer to because it suddenly started working again. (Cue the people saying “you had the volume turned down, didn’t you?”. So with everything that has been written can I now recommend Mageia to the readers of this blog? Absolutely. It's a shame that you waited so long to try again since your distaste was based off of misconceptions or misunderstandings. The GNOME network manager thing is direct from upstream, not something that Mageia designed, and bootable USB has long been *easier* than with other distros because all you have to do is write the ISOs straight to USB and they're bootable, unlike some distros like Ubuntu that can't bother to make their ISOs correctly and need hackish tools like Unetbootin to make them bootable (which just ends up confusing lots of people since that tool corrupts ISOs that are made correctly). Hi David, Thanks for the comment. It is now possible to simply extract a Ubuntu ISO to the USB drive directly without any other tools required. UNetbootin isn't half as effective as it used to be. I suspect that the Youtube video started playing after switching to the HTML5 player (I've seen this several times on systems that didn't have Flash installed). 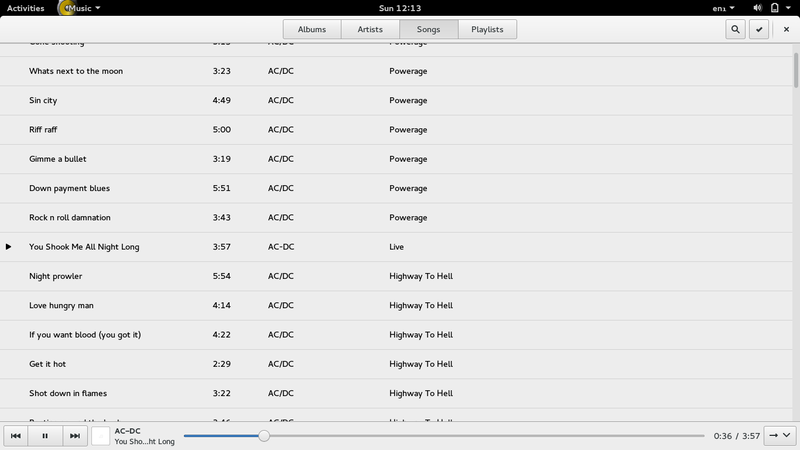 Of course, I don't know why the sound would not work while it was playing through the HTML5 player. I used to use Mandrake 6 and 7, but I have never tried Mageia. I haven't really used any rpm based distributions in a long time. I've been thinking about trying some of them out again, recently, but I still haven't taken the plunge. Mageia has always been my least favourite RPM based distro. It has really improved since the last time I used it though. Thanks for the tip Mindaugus. I have promoted this to the main review. nor edit any connection file. Thanks for the suggestion. I will remember this for future reviews of Mageia. I am going to move your trick into the main article. I'm not commenting on the review or the OS as such, the thing that I will say is that it saddens, annoys and/or make me angry at the Linux community that the overlook Mageia. It almost feels like they are trying to kill of this excellent distro by silence it to death, version 4 may not have been any good but it don't deserve the treatment it have got this time, but good reviews may/will ruin their plan. It should be said I have never been a fan of Ubuntu and its derivatives, I have liked Debian more, and I am not a regular Linux user mainly because I'm a gamer, I hope Linux(some normal distros at least) will become a good gamer OS, when the finished SteamOS is released.